In last week’s editorial, I reviewed some of Zelda’s early music, jumping around every few years or so. Not unlike the other outstanding qualities of Zelda games, the music has improved markedly through the ages. What started out as a fledgling franchise grew to become one of the biggest inspirations in gaming today and the soundtrack boasts an equally impressive legacy. Just as Zelda ages gracefully like a fine wine, the nostalgic if somewhat primitive music of yesteryear is just as good as it ever was. The work of Koji Kondo and the rest of the gang hasn’t gone unnoticed, especially in recent years. If anything, the music of The Legend of Zelda has just gotten better and better. Today I’m going to cover the music of the newer Zeldas, from the revolutionary tunes of The Wind Waker to the recent orchestral masterpieces that accompany Skyward Sword. Make the jump to continue reading! While Ocarina of Time and Majora’s Mask brought Zelda compositions into the third dimension figuratively, the mimicry of authentic and exotic instruments fall flat at times, especially when it comes to vocals. The Wind Waker addresses several of these errors, crafting a score that almost sounds orchestrated. Yes, the melodies are usually played by three or four instruments, but they sound magnificently realistic. To go along with the island vibe, songs such as “Dragon Roost Island” and Molgera’s battle theme feature instruments we would normally associated with indigenous populations across the world. 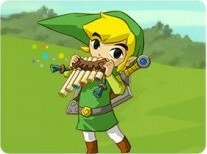 Music plays a big role in the game, as evidenced by Link’s trusty Wind Waker, Medli’s harp and Makar’s violin. The song that I believe best represents The Wind Waker‘s style is one that I have mentioned just a few lines of text above. It mixes together the velvety timbre of a bass guitar, pan flutes and even flamenco castanets. Yes, you heard me, and if you didn’t hear me, you’ve probably already heard the song. I won’t lie, I found myself quite obsessed with The Minish Cap‘s soundtrack for the longest time. Now some may dismiss the old-fashioned sound quality immediately, I say give it a good listen. Owning a decent headset may not enhance the experience like it would electronic music, but what makes the pieces so compelling isn’t the fact that it’s a retro throwback of A Link to the Past‘s unique sound. In fact, it molds its own identity and controls the feeling of the music much more professionally that the SNES classic. Sad songs sound sad, epic songs sound epic – each and every tune is a pleasant surprise. Among my favorites are the “Temple of Droplets”, “Palace of Winds” and the oft-played “Cloud Tops”. Usually common themes in Zelda games are designed to blend into the background and not draw your attention away from the game. This sometimes makes them less memorable than, say, boss battle themes. “Cloud Tops” makes great use of multiple layers of sound but doesn’t try hard to imitate the sounds of instruments, similarly to A Link to the Past. Everything about the soundtrack is nostalgic, but The Minish Cap adds the modern complexity of video game music, resulting in absolute 16-bit goodness. Twilight Princess brought Zelda back to a deeper, more emotional phase in its melodic history. Majora’s Mask played around with the concepts of sadness, death and suffering by expressing it through its score. Nintendo’s 2006 magnum opus for the Wii and GameCube delivered the goods with a somber, emotion-inducing soundtrack that spoke volumes through (in some cases) a minimalist approach to songwriting. On the contrary, Twilight Princess featured orchestral pieces composed strictly for trailers. However, when Link rides on horseback through Hyrule Field, the main theme aggrandizes to resemble an orchestrated piece. It was a nice touch that I really appreciated. Even the songs that are MIDI sound nearly orchestrated. The developers reach a level of musical realism that transcends far beyond the capabilities of The Wind Waker‘s soundtrack. Twilight Princess shows off a level of diversity we hadn’t yet seen in a Zelda game’s soundtrack. This advantage comes from the plethora of different instruments that can be imitated and the ever-growing creativity of the sound team. Songs like “Lake Hylia” perfectly exemplify the tranquility that normally only accompanies a steaming cup of Jasmine tea. The orchestrated “Hyrule Field”, “Blizzeta Battle Second Half” and “Death Sword” theme exuberate an incomparable grandiosity. However, the soundtrack excels at expressing sadness. Compositions such as “Faron Woods” shed a depressing light on the situation, making for some of the most atmospheric songs in the franchise’s history. Ocarina of Time won over the hearts of millions of fans with its distinctive, simplistic melodies. Twilight Princess‘ music is typically by no means simple, as I’ve attempted to play the sheet music of some of its most famous songs. The game’s simple elegant stems from the lonesome chords being played somberly. 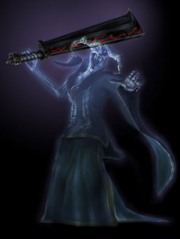 A sole voice in the distance, whether it be that of a being or an instrument, is a staple in the game’s music library. I can’t think of a better exemplification of this than “Midna’s Lament”. If anyone had any qualms with Spirit Tracks, I’m sure the game could be redeemed in part by its sensational soundtrack. For a handheld game, the music is of surprisingly high quality and often incorporates the sounds of train whistles to suit the train theme. A far cry from the repetitive Phantom Hourglass score, Spirit Tracks creates completely fresh tracks establish their own identities. Songs make heavy use of the digital sound of pan flutes, snare drums, guitars, violins and low brass instruments. This sound is very different from what came before. Many themes are delightfully menacing, matching the oddball characters they represent. The boundless talent of Toru Minegishi, Manaka Tominaga, Asuka Ohta and Koji Kondo is obvious here as each and every composition is memorable while still being relatively complex. I fell in love with Malladus’ final battle theme and the “Realm Overworld” song played while speeding through the vast overworld. These are exceptionally memorable and well-written pieces that hardly ever grow tiresome. If I could only use one word to describe Skyward Sword’s music, it would be “raw”. Yes, a full orchestra sat down to play out each and every song in the library. It also helps that this is the same core team that worked on Super Mario Galaxy‘s music. The overwhelming sound of a decently sized orchestra is best suited for powerful songs like the “Ballad of the Goddess” and the battle theme for Koloktos and Moldarach. Howsoever, it also brings to life vibrant pieces like “Faron Woods”, “Lake Floria” and other overworld and dungeon background tracks. Unfortunately there are not a lot of heartfelt pieces to speak of. Although the sound quality is very rich and completely overshadows the quality of previous game’s soundtracks, solo pieces that accent emotional moments in the game will often be played with too much enthusiasm. In fact, nearly every song in the game is remarkably upbeat. Aside from this minor complaint, the composers manage to inject a booming, intimidating vibe into the music that works in perfect harmony with the fairly large orchestra. The music of Zelda has shifted constantly over the ages and finally made the switch to orchestral music just last year. Hopefully the trend will continue and we have the pleasure of hearing what Zelda has to offer in the future. So what do you think? Do you like the direction Nintendo is taking with Zelda’s music? Feel free to let us know in the comments below!